Finally the long wait is over! The LF 2200m band and the MF 630m band have finally arrived for amateurs in the USA! I'm sure most of you have read the fine print regarding deployment of the two bands, but if not, here is the ARRL's recent announcement. It has been a very long wait for the FCC to implement these bands after they were approved for amateur use in 2007 and 2012 at the World Radiocommunication Conferences in Geneva. Canadian amateurs have had 630m since 2014 and 2200m since 2009 ... in the meantime, we have been anxiously awaiting the arrival of American amateurs to liven things up and to garner new interest in these bands. Before operating on these bands, amateurs in the USA are required to register their intent via a simple web form found here on the Utilities Technology Council's website. Then follows a 30 day waiting period during which the UTC will check out your location to be sure that you are not located within 1km of any power lines that might be carrying LF or MF PLC (Power Line Carrier) control signals. If you hear nothing back from UTC within 30 days, you are good to go. A positive outcome of registering via the UTC form is that there can be no PLC signals implemented on the lines near you at a later date! By registering your intended operating location(s), you are locking-in these spots for no further PLC development. If you have an EOC or Field Day site that you think you may want to operate from at some point, register these as well. 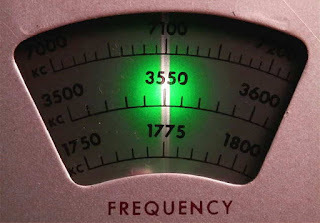 I think it is important that even if you do not intend to operate on either of these bands or perhaps a few years down the road, that you register as soon as possible ... the fewer PLC signals operating close to or within the amateur radio spectrum, the better, and this is one way of furthering that goal. There has already been a vast amount of published information on both of these bands, describing transmitters, receiving systems and transmitting antennas so I won't go into much detail here regarding these topics ... and besides, it's always very interesting to search these things out yourself, learning as you go. Be assured that either of these bands will present interesting new challenges not encountered in typical HF operation, but all of the basic principles you are used to still apply ... it's just that things are much bigger down below the broadcast band! Far and away, the best source of information for US amateurs can be found on John Langridge's (KB5NJD) NJDTechnolgies website. John has been operating on MF for several years already with an experimental licence (WG2XIQ) and is more than an expert on this topic. His daily blog includes a detailed account of worldwide activity on 630m and makes for fascinating reading. His website provides all of the information and valuable links that you might need to plan your own LF or MF station. The information on his site, if printed out, would make a wonderful LF / MF Handbook! My own blog and website also contain much helpful material, with a particular emphasis on Canadian activity on these bands. All of my blogspots dealing with 630m can be found here and contain enough bedtime reading to keep you busy for many nights. If you are thinking of getting on either of these new bands, particularly 630m, here is a short Q & A that may help you through the initial planning stage of how to get started. What modes are commonly used on these bands? At present, due to the low level of two-way amateur radio activity, the WSPR mode has been dominant. This is a weak-signal 'beacon-only' mode so most two-way contacts take place either on CW or on the weak signal JT-9 mode. JT-9 has been specifically designed for HF and LF / MF weak signal two-way work and can dig as deep as -27db into the noise to provide a contact that could never be completed on other conventional modes such as CW. With the influx of new activity on these bands, particularly on 630m, I expect that most two-way work will equal or surpass the amount of WSPR activity and that JT-9 and CW will do most of the heavy-lifting. How far can I work on these bands? Although the erp limits appear to be QRP-sized, this is somewhat misleading ... it is astonishing what can be done. 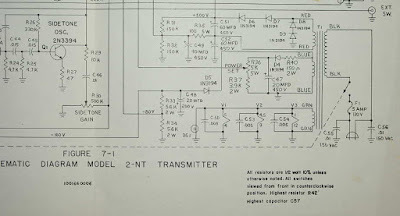 Don't think that '5W eirp' means that you can only run a transmitter capable of generating 5W. Because antennas are so inefficient on these bands, it is often necessary to run several hundreds of watts in order to achieve the legal eirp limits. The bigger and more efficient your antenna, the lower the power needed becomes. On many nights, 5W eirp will get you clear across the country on MF. However, if you build something for 630m that only produces 25W of power, you will still have the capability of working many stations in other states on most winter evenings or mornings, as propagation, the 'great equalizer', can be amazing at times. Presently, most stations operating on WSPR will often be detected from one coast to the other and those with excellent locations near the coast will soon be working stations down under or in Europe, either on CW or on JT-9. If you can, design and build for the maximum eirp, 1W on 2200m and 5W on 630m. 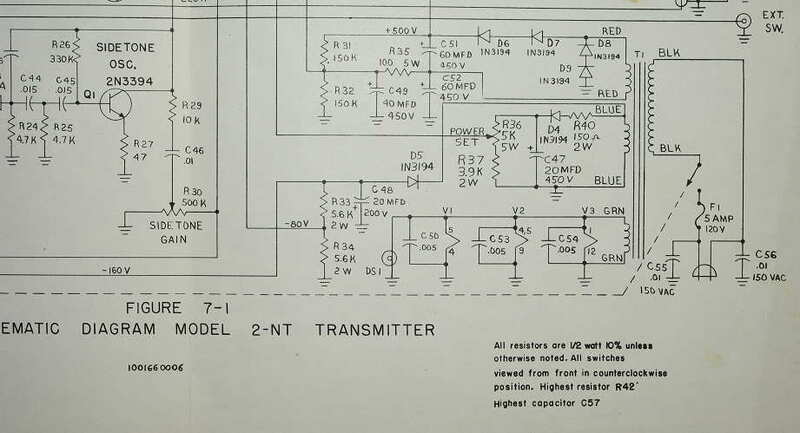 What type of transmitter do I need? If your interests are only in CW, then the sky is the limit when it comes to design. There are numerous simple solid state transmitter designs out there, using inexpensive FETs to generate power. I'm hoping, along with many others, that there will be a considerable amount of CW activity on 630m and even a simple 25-watter should provide you with lots of fun. There may also be some appetite for QRSS CW which can give the weak-signal digital modes a run for their money while still using a simple transmitter. 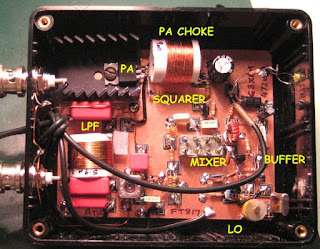 If you are interested in digital modes, such as WSPR or JT-9, the easiest way is through the use of a transverter to take care of converting your HF transceiver's capabilities to LF or HF. There are presently a few commercial transverter options available and can be found on the NJDTechnologies links page. 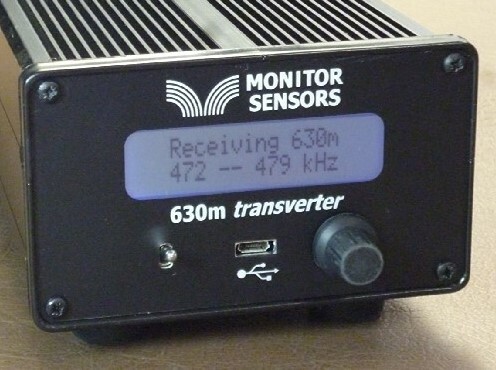 A good choice is the inexpensive 630m transverter produced by John Molnar, shown below and available both as a kit or prebuilt. It works well and is very popular. Although not available commercially, another popular 630m homebrew design is one from G3XBM which will also provide a way to get on the digital modes. He also has a 2200m design, should your interests be focused on that band. Any of these simple transverters are capable of controlling a higher-powered switching FET amplifier as your station progresses. If you want something in the 'Collins category', the tranverters (both 2200m and 630m models) produced by VK4YB's Monitor Sensors provide around 70W output and are incredibly well designed and built. I have been very happily employing a 630m model for well over a year now ... my review of the transverter can be found here. I suspect that we may soon see more commercial products become available over the next year but if you are handy with a soldering iron, building your transmitter will all be part of the 630m challenge! I would like to put on a beacon. What do you suggest? The best and most informational type of beacon is a WSPR mode beacon. A WSPR beacon operator can always determine where his beacon is being heard, in real time, along with how well it is being heard, by watching the uploaded 'spots' of his beacon on the WSPRnet. You will have much better coverage with this weak-signal mode beacon compared to one on CW ... for every CW report received, you would likely get ten times or more that number on WSPR. Although WSPR is a great mode for checking out propagation, it's very easy to get into the habit of nightly beaconing and not developing your station any further. If you do run a WSPR beacon, be sure to try some of the other two-way modes such as CW or JT9 and call CQ regularly ... ham radio is all about making two-way contacts! I don't have enough property for the large antennas required, so I won't be able to use these bands. Even if you are limited in space, you can still enjoy these bands. 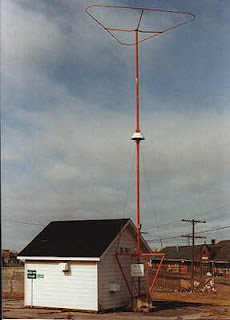 There are many examples of stations on small city or suburban-size lots that are consistently heard across North America on 630m. If you have the room for an 80m or 40m dipole or inverted-L, that will be enough space to work these bands. An inverted-L for example, can be base-loaded and tuned to resonance. Along with several ground radials, even a small antenna system like this will allow you to work skywave DX or be heard across the country when propagation is good. I'm constantly amazed at how well these bands propagate with very low amounts of erp. Don't let living on a small lot stop you from exploring these bands! All I hear is noise on these bands ... how can I use them if I can't hear anything? Growing noise floors are common to everyone and this is often the biggest challenge for LF and MF operators, especially those in densely populated regions. Armed with a little knowledge and investigation, oftentimes seemingly impossible QRN can be substantially reduced if not eliminated entirely ... even easier when the noise source is found to be in your own home! While some amateurs just give up at this stage, most will see it as an interesting challenge to be overcome and part of the many learning experiences offered by these new bands. In addition to the informational links provided above, I have just added a new 'Getting Started On 630m' page to my website. This page has a two-part article that I recently wrote for The Canadian Amateur, our national amateur radio journal. The articles describe a simple way of getting on 630m CW as well as providing some basic antenna information and ideas. This blog also has extensive writings involving 630m over the past few years, describing equipment used and suggestions for new operators, much of it involving homebrewing. There are several links on the right that will take you to specific blogs dealing with 630m. For present LF and MF operators here in Canada, the arrival of our American friends to these bands is generating much excitement and anticipation. The opening of these bands in the USA will pump new life into this part of the spectrum for all North American participants and the opportunities for homebrewing and experimenting are boundless. It should be a very exciting winter! If you have not taken the 60 seconds required to register your station on the UTC webpage, please don't neglect to do this via the link provided above. There have, reportedly, been thousands of amateurs doing this already, as it effectively locks-out their locations for any future PLC deployment that might keep them off these bands at a later date. See you in mid-October on 630! This coming weekend will see another CLE challenge. This time the hunting grounds will be: 400.0 - 419.9 kHz. A nice challenge in this one is to hear the Saint Catharines (Ontario) NDB, 'SN', on 408 kHz. 'SN' is a 15-watter and is well heard, having been logged from coast-to-coast. Look for 'SN's CW identifier, repeated every 10.5 seconds, on 408.398 kHz with your receiver in the CW mode. Late summer CLEs can often be challenging, not because of poor propagation but more likely, lingering summer lightning storms ... hopefully it will be quiet for your location. Here is your Early Advice of our next Co-ordinated Listening Event. frequency range - and celebrating the equinox on 22nd Sept.
All beginners, occasionals and regulars are very welcome to join in. 400 kHz but not 420 kHz) plus any UNIDs that you come across there. Please look out for the Final Details on Wednesday. 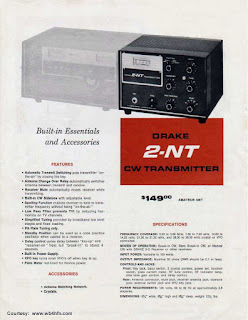 One of this summer's radio workbench projects was to refurbish my Drake 2NT transmitter for this winter's NRR event. The 2NT was introduced in 1966 with the 'novice' ticket-holder in mind, selling for $129. 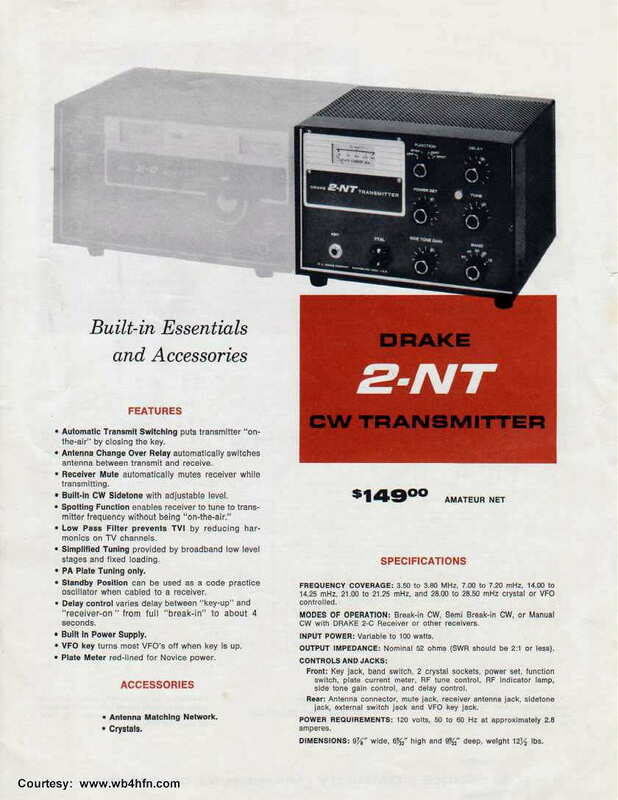 It was the first and only CW-only transmitter produced by R.L. Drake. 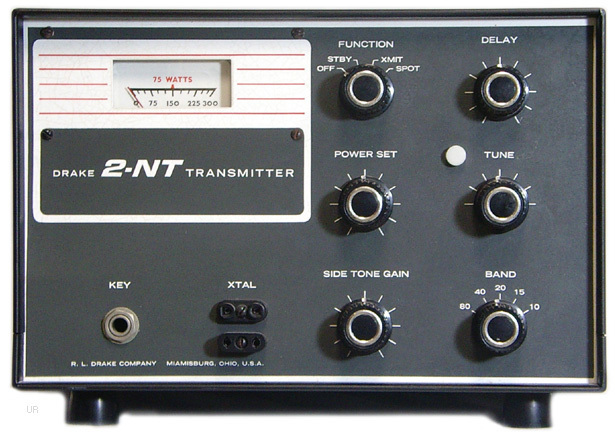 As novice transmitters go, the 2NT was a cut above some of the others out there, boasting interesting features such as a built-in antenna changeover relay, sidetone oscillator, grid-block keying and built-in low pass filter. 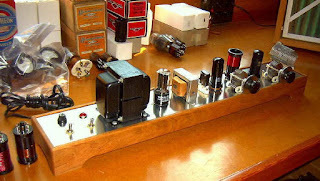 The tune-up procedure was simplified as well and with Drake's reputation for quality construction, the 2NT became a popular choice for Novices and Generals alike. 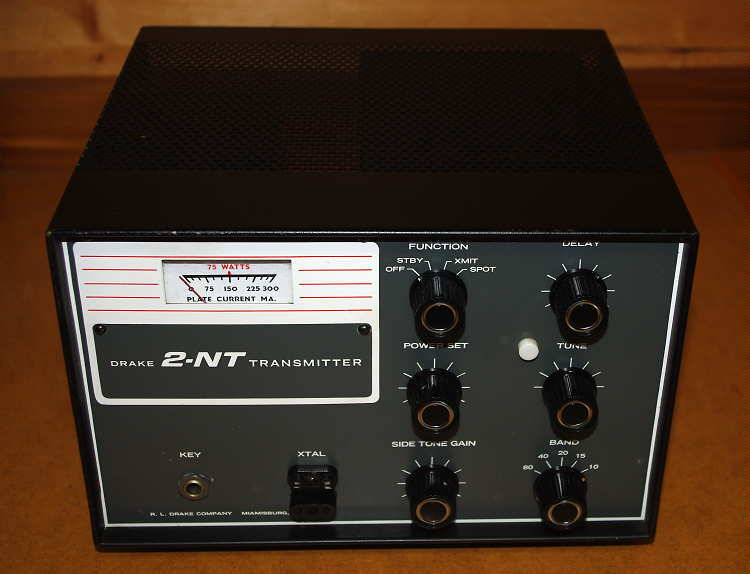 My own 2NT was purchased, along with the matching 2C receiver and speaker/Q-multiplier combo over 25 years ago at a Washington state ham fleamarket. Ever since then they have been patiently sitting on the shelf, trying to catch my attention. The motivation and much-deserved attention finally arrived this year after enjoying last winter's NRR and hearing several great-sounding 2NT's on 80, 40 and 15m CW. I operated the week-long Roundup with my homebrew 'Longfeller' at 5W output, in order to qualify for the QRP category. I have to admit, the Novice Rig Roundup, was one of the most enjoyable contests I have entered in many years! Hearing many rigs from the 50's and 60's sounding so good was just a bonus. 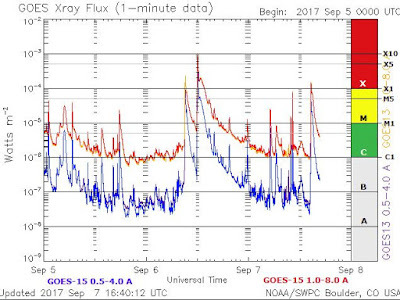 It was particularly gratifying to be able to work the midweek daytime activity on 15m ... a luxury that we may not enjoy now for several years if most of the long term solar forecasts are correct. 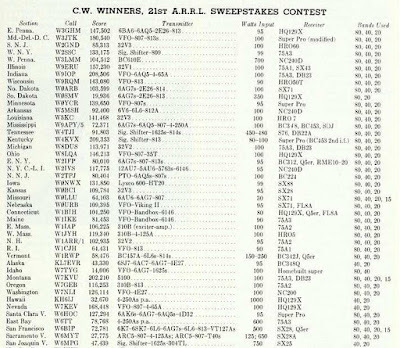 I eventually ended up with 68 contacts, but at 5W, it was a challenge ... most of my many 'CQ NRR' offerings were unanswered, so it was mostly a 'search and pounce' operation. With this in mind, I soon decided that next time, I'll get the 2NT ready to go and hopefully, with a little more oomph, can attract some callers. Rather than hunt down and purchase the individual replacement electrolytics, especially the multi-unit can capacitor which was impossible to source, I ordered the '2NT re-cap kit' from Hayseed Electronics. They supply replacement kits for several boatanchors and are able to make and stuff multi-section can capacitors to match the original size and specs ... and all at affordable prices. Keydown voltages averaged ~520V while plate current ranged from 170-200ma. All-in-all, right on target and not bad for a 51 year old transmitter! The 6EA8 modified Pierce oscillator in the 2NT seems particularly 'crystal-friendly', as every old style FT-243 style crystal that I tried sounded great. Even the newer ones from AF4K using a modern HC-49 crystal slab mounted inside a vintage FT-243 holder sounded great and worked perfectly. A couple of days later, I returned to the bench to take some blog photos of the rig delivering power into the wattmeter. 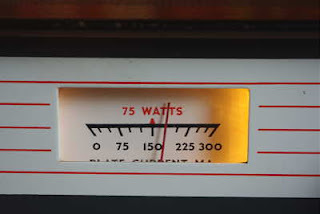 When I turned the 'stby' switch to 'transmit', the plate current suddenly shot up (with no keying) and the meter on my Variac supply indicated over an amp being drawn by the power transformer ... all with zero output and no crystal plugged-in! A look at the schematic diagram revealed that with the grid-block keying system, the final amplifier's cathode is always grounded and a low voltage negative bias applied to the grid keeps the plate current cut-off until being keyed ... with cut-off bias missing, plate current will soar, along with transformer primary current. I suspected that something had gone haywire with the bias supply. A quick check of the 2NT's printed circuit board containing the bias system components among others, indicated a discolored silicon rectifier (D5) in the bias supply. An in-circuit measurement revealed that it was indeed shorted, basically supplying raw AC across the filter capacitor and shorting out the transformer winding, quickly elevating the transformer's temperature in the bargain ... not good. Although the diode only has to handle a small amount of current, it was mounted with a heat-producing 2W resistor straddling its top surface. As well, the phenolic circuit board was noticeably discoloured from the heat. I suspect this was the main reason that D5 eventually failed. My 2NT was an early one, serial #670, so perhaps this parts-arrangement was re-engineered in later models. Once the diode was replaced with a much smaller modern one, of twice the rating, everything returned to normal. The last thing I would want to do at this stage is to burn out the transmitter's unique power transformer, undoubtedly impossible to replace nowadays. 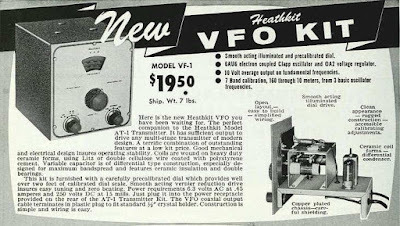 The next bench project will be to refurbish and improve the stability of my Heathkit VF-1 VFO and to mate it with the 2NT. There are several things that can be done to a stock VF-1 to improve its performance. Its wonderful backlit green dial will bring back a lot of memories from my teenage operating days with the VF-1 ... most, but not all of them, warm and fuzzy. Another small quirk noticed on my 2NT is the meter mount. My early model has the meter mounted so low that the silk-screened 'PLATE CURRENT MA.' label is not clearly visible when looking straight-on. Later models show that this was changed by moving the meter a little higher so that the label can be easily seen without having to look down inside. Nothing major, but something apparently missed during the initial panel design. I'll have more to say about the 2018 NRR later, but if it's something that you may be interested in trying and you don't yet have a suitable novice-style rig, it's not too late to start looking, building or refurbishing. You can read many interesting soapbox comments and see some nice NRR station photos from the previous two events here and here, but read with caution as you could easily get hooked. I find pages like this very inspiring and they remind me of the days when QST would publish photos, soapbox comments and exacting equipment descriptions used by each section winner in the annual November Sweepstakes contest. Winner's gear in '55 CW SS - remember these? NRR activity really skyrocketed last winter and I expect that it will be an even busier event next time. 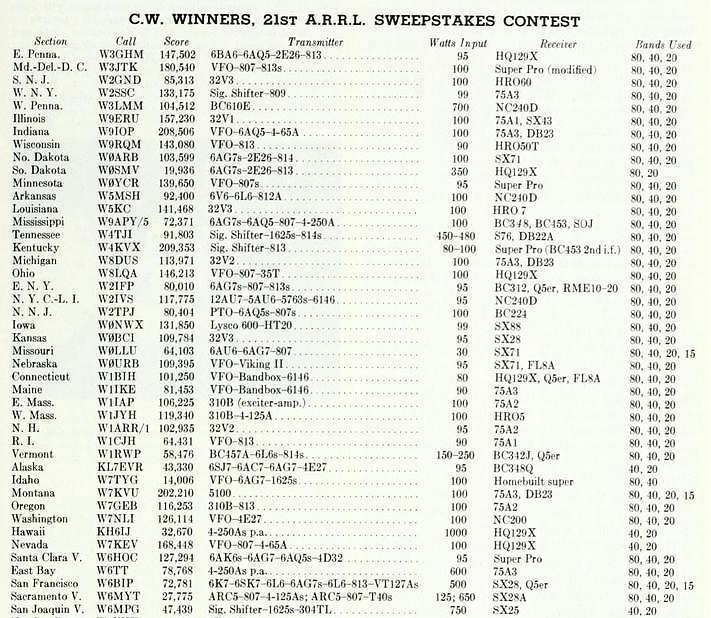 There are several CW contests that I'm looking forward to this winter and the NRR is right near the top of the list. I hope to see many of you in the 2018 NRR! 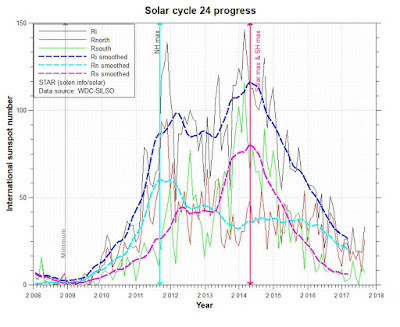 Well, just when the sun was showing some nice signs of growing quiet for the upcoming winter, Cycle 24 has once again demonstrated that it's not going down without a fight. For the past few weeks of quiet solar conditions, low band propagation, in spite of the time of year, had been performing well, with both 40 and 80m having a nice level of evening CW activity stretching out to the central states and to the east coast. That all changed this week when the Sun let loose with a series of powerful flares, one of which was the strongest in a decade ... all very surprising for a Sun that has already shown us many days of spotless conditions as it winds its way to the bottom of the cycle. 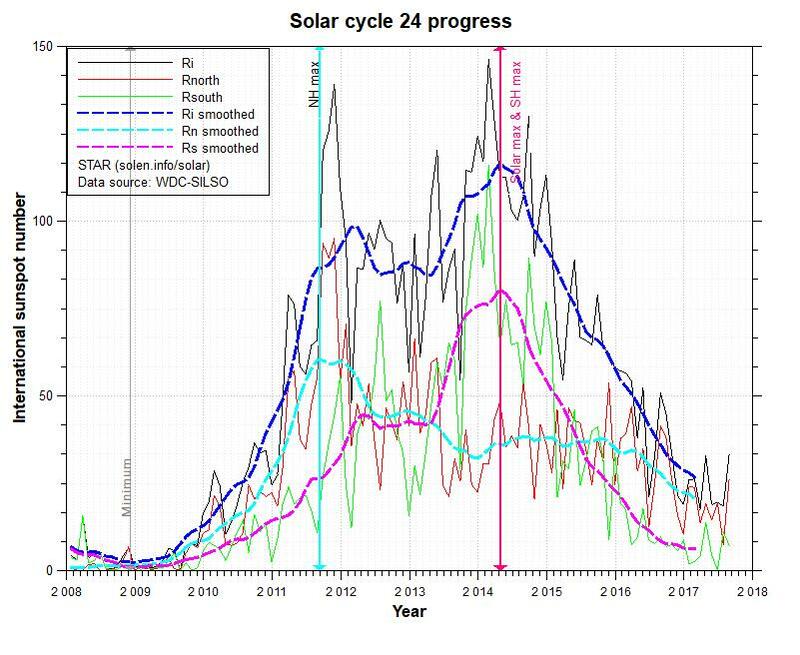 With Solar Cycle 24 being one of the weakest on record, it has shown levels of activity on the way down that could rival the past few much stronger cycles in their waning years. 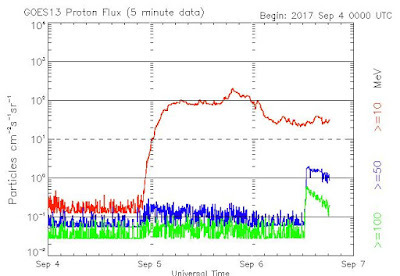 Another oddity for this cycle was its 'double-peak', not unusual per se except that 24's second peak was the stronger of the two. With the recent flaring and accompanying radio blackouts, HF propagation has been poor and with auroral conditions forecast for the arriving CMEs, it may take some time to recover, especially on LF and MF. But it may not be all bad. Disturbances like this will normally affect E-W, polar and Trans-Atlantic paths more than N-S paths. Oftentimes, paths to South America on MF and HF will be enhanced as will the Trans-Pacific path, so all is not lost. 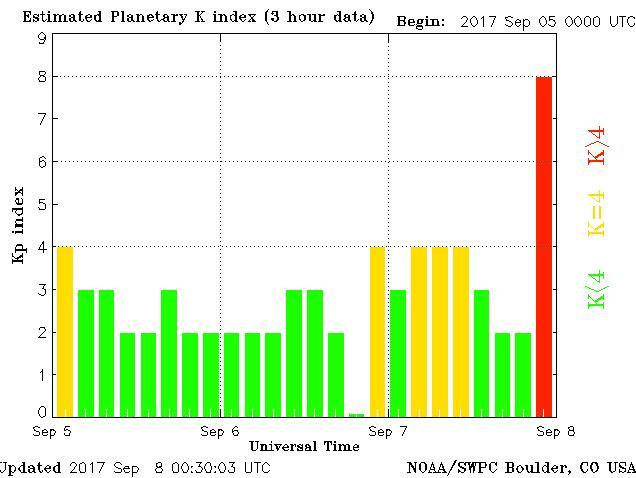 There are many websites devoted to providing a 'heads-up' to what might be coming geomagnetically-speaking. Two of my favorites are here and here. 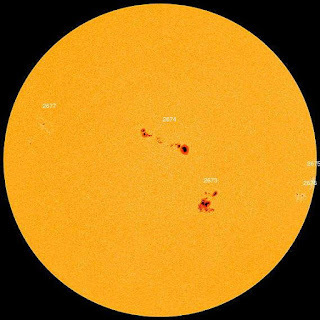 The more northerly you are, the more disruption you will notice and for some reason, VE7 land seems particularly in-tune with solar perturbations as the slightest hiccup on the Sun seems to immediately wreak havoc here. 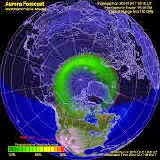 Even amateurs a hundred miles to the south or southeast, enjoy markedly less disruption than us out here on Canada's western edge ... for some reason, we seem more tied-in to the auroral zone activity than we should, given our westerly location. Perhaps the zone dips lower in this region than it does further east but it is something I have observed on LF and MF for decades now. 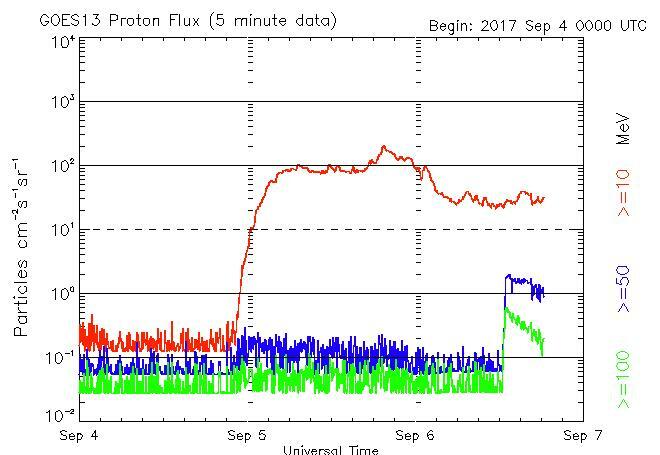 Spaceweather.com for updates and more information about this developing event. Hopefully the sun will outgrow its latest temper tantrum and get back to normal quickly so that this fall and winter will be one of the best for low band and MF work in the past decade ... with a quiet Sun, these frequencies can perform amazing magic at times. VE7CNF / 630m Mobile ... almost. Hot on the heels of his recent 630m maritime adventure, Toby (VE7CNF), continued to demonstrate the flexibility of his small 20W 630m portable system with an afternoon of fixed 'mobile' activity from his vehicle. "Are any of you available on Tuedsay for a 630m land mobile test with VE7CNF/7?" Toby set things up at Sea Island's Iona Regional Park, situated on the ocean's edge just north of Vancouver International Airport. This gave him a good shot to several of the local 630m ops around the local region. When Canadian amateurs first approached RAC and Industry Canada for a slice of spectrum near 500KHz, the main goal was to secure a frequency range that would support excellent groundwave propagation for a possible future emergency data network. Whether this will ever happen or not remains to be seen, but Toby's afternoon outing, along with the recent 630 marine mobile activity certainly helps to demonstrate the potential for the band to provide reliable signals with relatively small antennas and low erp. 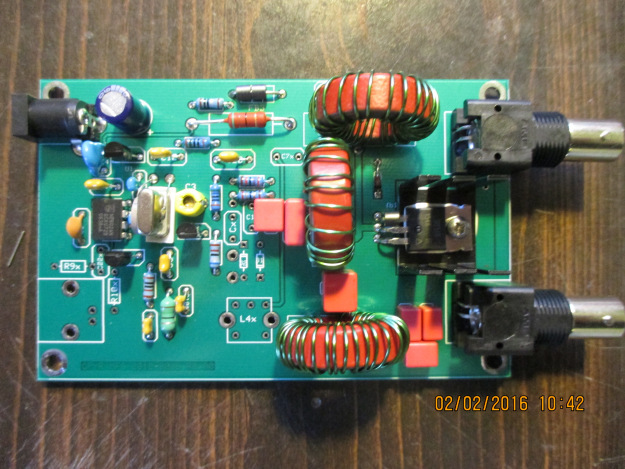 "I’ve developed a 630m band linear transverter that produces 30W of transmitter power. It has no power amplifier and draws only 175 mA from a 12V power supply. It works for both transmit and receive with no T/R antenna relays or switching circuits. I’ve used a bidirectional high-power mixer circuit to directly take 100W of power from a 160m band transceiver and produce useful output power on 630m. For receive, 630m signals can pass backwards through the circuit and are up-converted to 160m. My transverter is actually the small box on the dash above the steering wheel. The gear in the back near the variometer is used only during setup to resonate the antenna. It's a signal generator and oscilloscope. The AC transformers are just an isolation transformer that I need to make the test equipment work with my 12V-to-AC inverter." "VE7CNF/7 Operation was from the Iona Beach area near Vancouver, grid CN89jf. The location is right beside salt water. There are no nearby power lines so rx noise was S0. Operation was in daylight, around 4 pm local time. Signals were excellent and all CW was easy copy. On 475.0 kHz CW I managed to work Roger VE7VV (CN88il, him 529, me 579) and Jack VA7JX (CN79kv, him 569, me 579). I heard Steve VE7SL (CN88iu) at 599 briefly, then he had a problem and we didn't complete a QSO. He gave me 599 later by email. The antenna is about 24 ft high and the fishing-rod-and-wire top load is pulled forward about 8 ft. The matching circuit is a loading coil, variometer, and autotransformer. My Tx power was 20W TPO and estimated EIRP 75 mW. 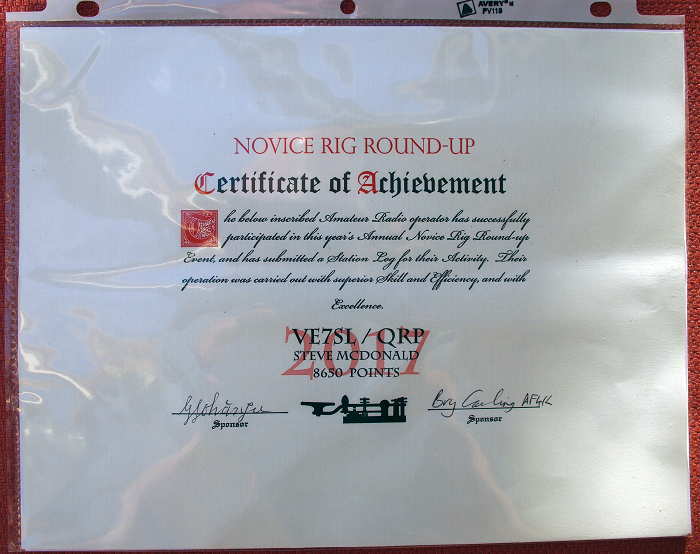 The rig was my home brew transverter with an IC-7410." "After CW I ran WSPR for a while, 23:42 to 00:08 UTC (4:42 to 5:08 pm local). WSPRnet lists my spots as my home QTH CN89ng, but I did have CN89jf entered in WSJT-X. I got spots from WI2XJQ -17, VE7BDQ +14, VE7AB +6, VE7VV +1, W7IUV -26, WH2XGP -30 dB. I also decoded WSPR from VE7VV +7 and VA7JX +9 dB." "This was great fun. I'll have to try more locations, and see if I can improve the equipment for easier setup. I had great copy on Roger 529 and Jack 569. Working Jack was a surprise, and his signal was excellent. Being beside salt water is magic. Rx noise was so low at that location, near Iona Beach CN89jf." Our 'new' band continues to demonstrate its ability to offer exciting opportunities to experimenters, home-brewers and DXers alike and for those with the creative imagination to push new boundaries, who knows where one of the first frequency ranges to be used by amateurs back in the 20's might eventually take us. I can visualize, at some point in the future, the usefulness of a province-wide 630m emergency comms network utilizing a basic 'grab and go' system based on much of Toby's demonstrated work. 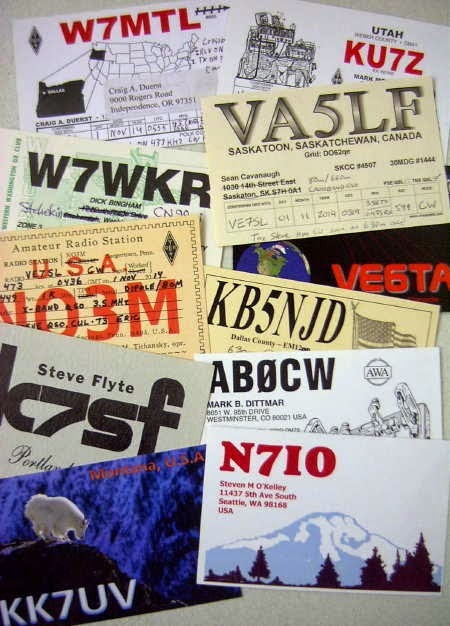 If you are a Canadian amateur why not join the fun on 630m now? U.S. amateurs will be arriving shortly and when they do, things should be getting even more exciting on the new band!